Our Recent Projects | Commercial Architectural Products, Inc. This project is centrally located in the city of Blackhawk and is the first large structure that can be seen driving up the mountain. 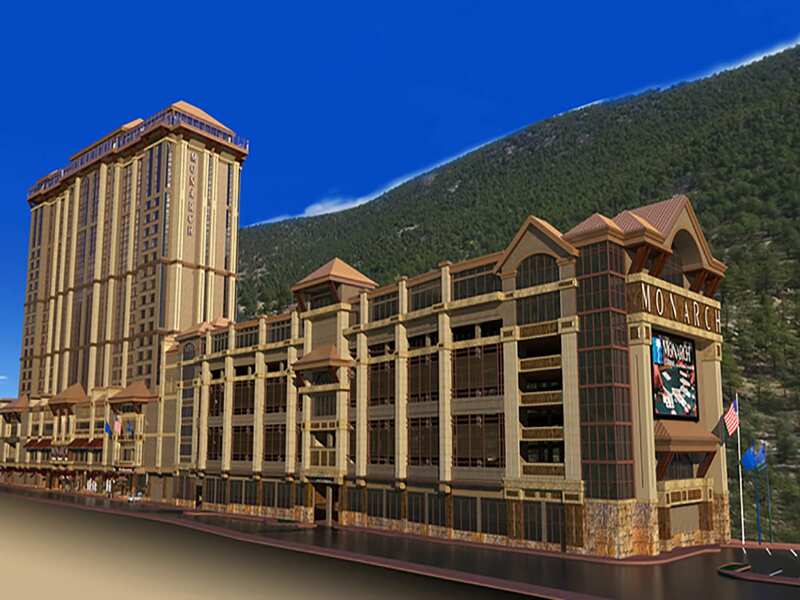 CAP was contracted to build the 23rd floor of the casino using Oldcastle’s Reliance SS system with a metallic copper-painted finish. The product features two-part verticals used primarily in unitized glazing procedures. While some verticals require steel, all frames were sent to the project crated, to be flown by crane twenty-three stories to the top of the building. 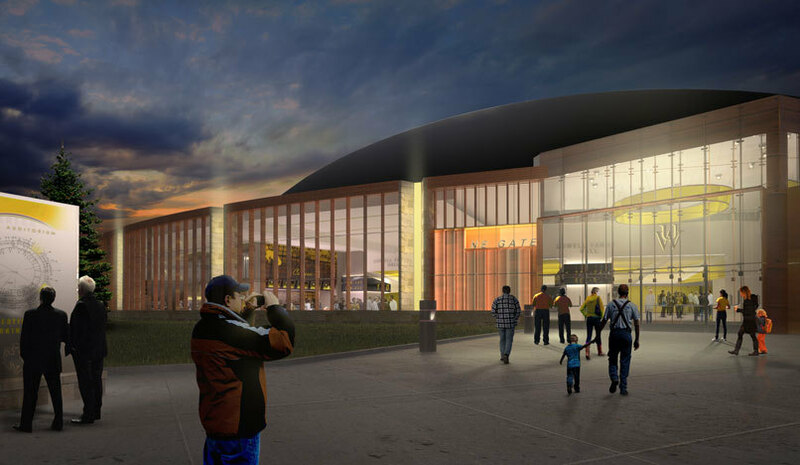 Contractor: Colliers Bennett & Kahnweiler, Inc. Using Oldcastle’s Vistawall FG3000 Storefront and the Rhino 900 Fabrication Center, CAP’s fabrication team was able to efficiently and accurately produce the storefront for this retail center with record build-durations. From receipt of drawings to final delivery of frames, the full project duration totaled at 10 working days. 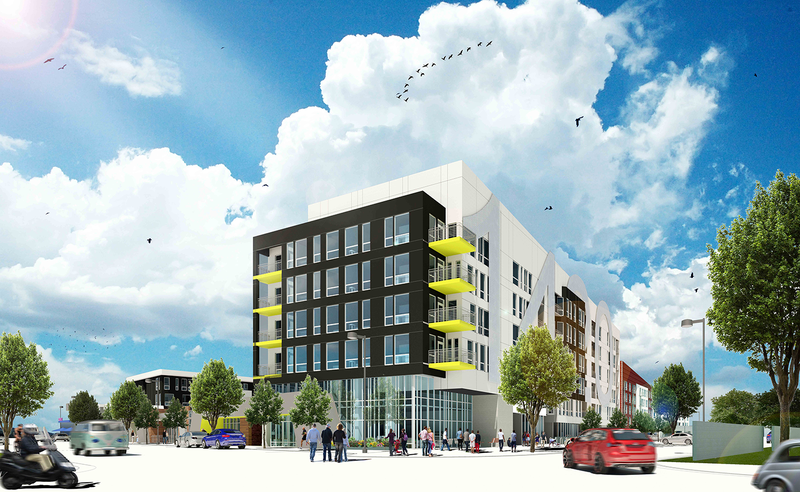 challenges, including several heavily mitered trapezoid frames and varying applications of our product from punched openings to cornering, ground-level storefronts. customized ice-barrier to help capture collecting weather elements. CAP implemented our crating procedure to help protect the product both during transportation and storage. liberal steel-loading in both storefront and curtain wall systems, and creative shipping procedures to ensure large quantities received and material damage prevention. project also included preparation of vertical mullions for mitering, which would later be cut to fit a variety of arches that occupy the facility’s entries. 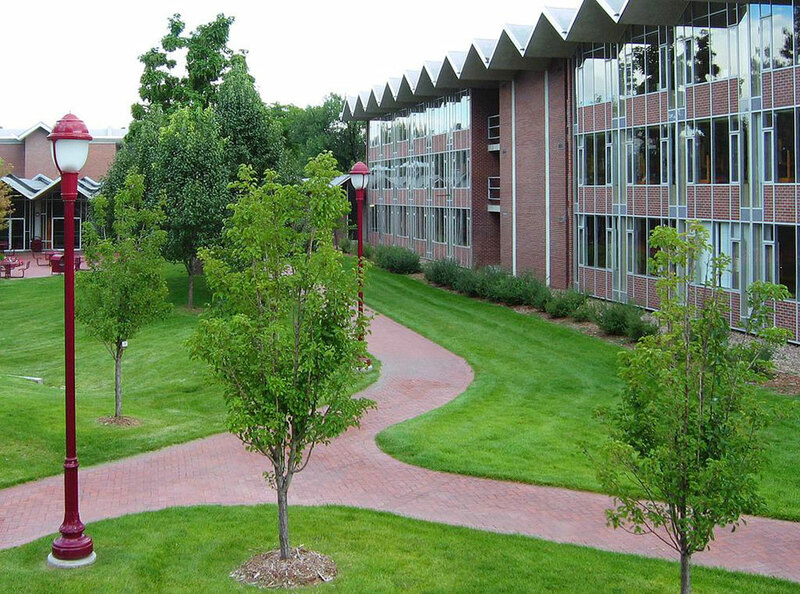 The CSU Biology Building is a 3-story research building on the Colorado State University Campus in Fort Collins, Colorado. This project was fabricated by C.A.P. Inc. using Kawneer Ultra-thermal storefront and curtain wall, with a sunshade accessory. These systems include: Kawneer VG451 Center-glaze, 1600 UT System 1 Curtain wall, and the Versoleil CW/SF Sunshade system. The curtain wall system includes many double jambs and sills to provide a 5” profile around frame perimeters. The curtain wall and storefront were shipped pre-tapped to steel for ease of sunshade installation. Cornering sunshades were compound mitered at both 90 degrees and 72 degrees. 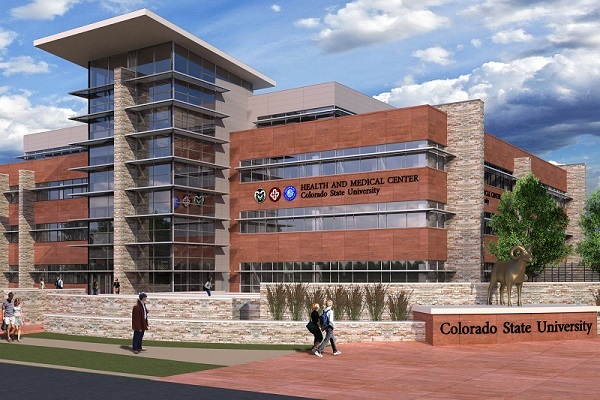 The CSU Health and Medical Center is a 4-story building on the Colorado State University Campus in Fort Collins, Colorado. This project was fabricated by C.A.P. Inc using Kawneer Ultra-thermal 1600 Curtain Wall (System 1), 451T Center Glaze Storefront, and the Versoleil CW/SF Sunshade system. Curtain wall and storefront systems were pre-tapped to steel for ease of sunshade installation. Cornering sunshades were compound mitered at 90 degrees for both curtain wall and storefront elevations. All stairwell elevations and the roof monitor also include custom mitering for the lantern-style sloping roof. This Amenity Deck is a recreation center located on the 5th Floor of the Country Club Towers project in Denver, Colorado. The project was fabricated at C.A.P. 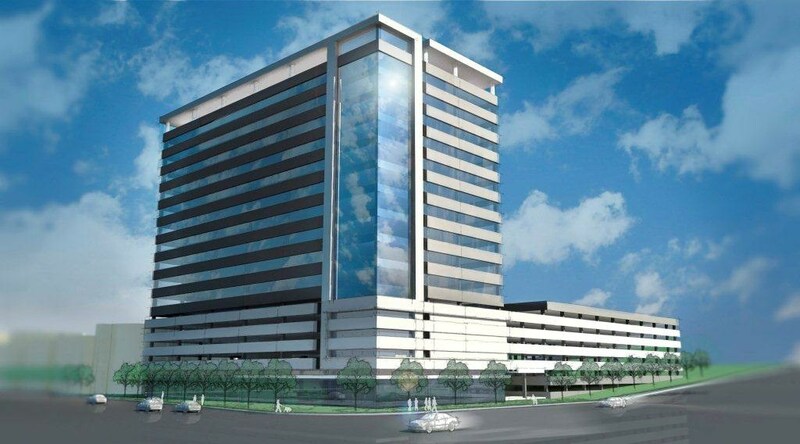 Inc. using Kawneer 1600 Screw-spline curtain wall. All frames were assembled, pre-drilled for fastener access, and steel loaded in-house for ease of install by Alliance Glazing Technologies. 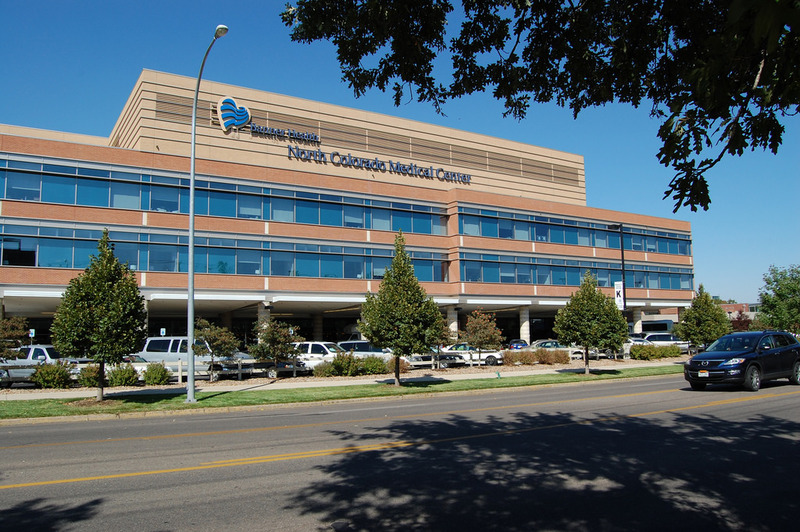 NCMC building C is a new addition to Medical Center located in Greeley, Colorado. C.A.P. Inc fabricated a Kawneer 451T FS strorefront system for Metropolitan Glass to install. Finished frames were delivered to the job site. 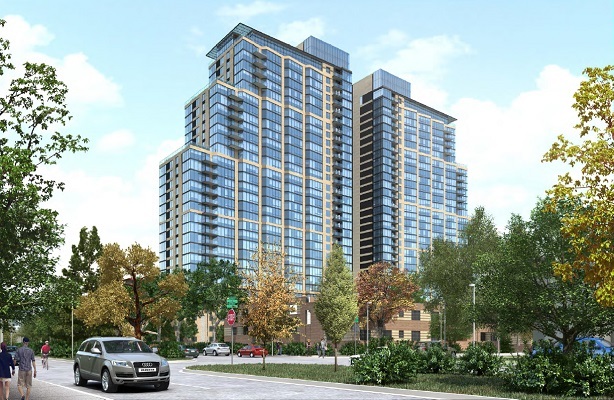 Glazing Contractor: Alliance Glazing Technologies, Inc.
Confluence mid-rise and hi-rise apartment complex is located in the center of the Denver metro area. C.A.P Inc fabricated .040 and .080 aluminum sheet to make custom inside and outside corners as well as the custom sill flashing and brake metal required for this project. Material was delivered by floor to the job site for Alliance Glazing Technologies, Inc. to install. 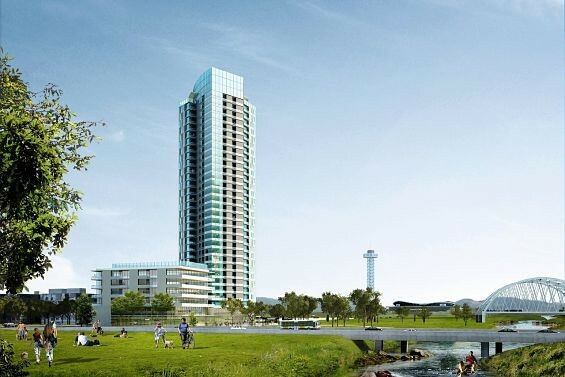 One Belleview Station is a 16 story building in the SE corridor of Denver, Colorado. C.A.P. 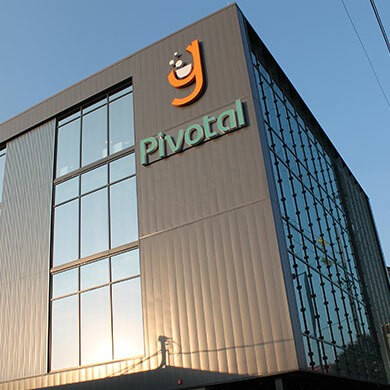 Inc fabricated this project using US Aluminum FT601 and 451 SF glazing systems for Metropolitan Glass to install. Pre-glazed frames were delivered to the job site. 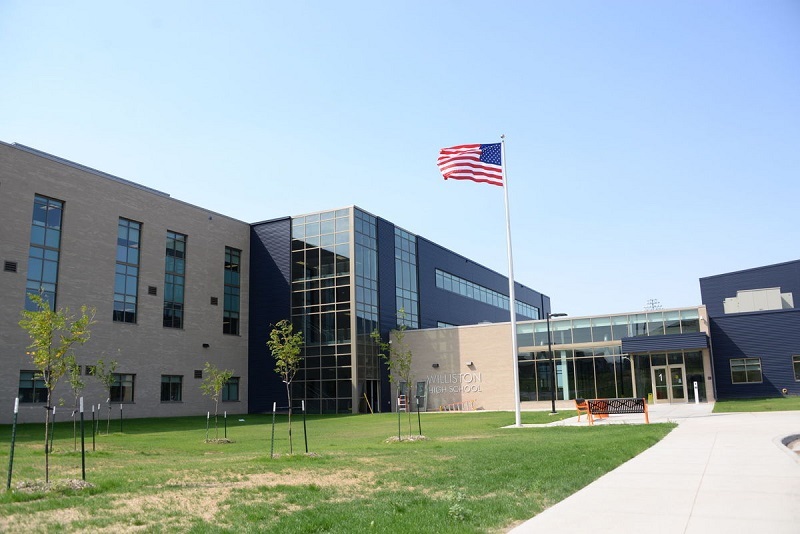 Modern high school built in Williston, North Dakota using Oldcastle FG2000, FG3000 storefront and Oldcastle Reliance Screw Spline curtain wall. C.A.P Inc fabricated this project for Big Mountain Glass and shipped to them for installation. Custom brake shapes were added to complete the storefront and cutain wall conditions. Special steel loading and strap anchors were incorporated into the glazing system. 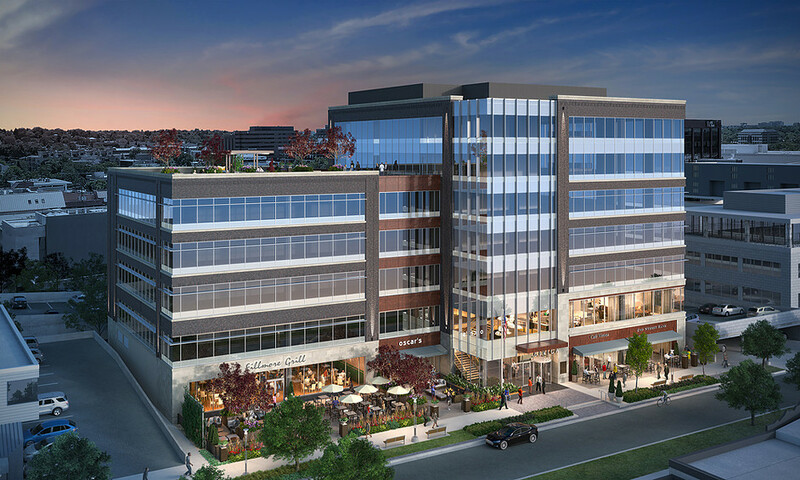 Built next to the Anschutz Medical Center, this hotel and conference center help complete the master plan for Fitzsimons Village. C.A.P. fabricated Kawneer 1600 SS and 1600 JS to complete this project for Alliance Glazing Technologies, Inc. Because of the unique design, head and sill sections of the curtain wall were custom fabricated in order to provide a stacking seal application. C.A.P. Inc also custom notched the verticals to accomodate hanging bracket anchors. Finished frames were delivered to the job site by floor. The Wencel Building is a 70,000 square foot Leed Gold Certified Class "A" office complex in the heart of Boulder, Colorado. C.A.P. Inc fabricated the Kawneer 451T glazing system with custom made strap anchors for Metropolitan Glass. Custom door frames were also made to specified drawings. Finished frames were delivered to the job site. 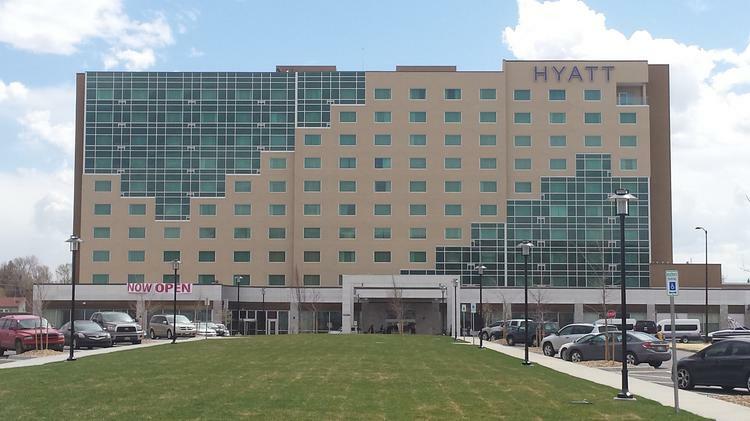 The Hyatt House and Place is a 21 story hi-rise hotel in the middle of downtown Denver, Colorado. C.A.P. Inc fabricated an Efco 403 storefront system and an Efco 5500 IG curtain wall system for Horizon Glass Company. Custom mitering and notching was required for the 15 degree pitch at roof level. The strorefront frames were pre-glazed and, along with the curtain wall, delivered to the job site. This 112,000 square foor addition to the Anschutz Medical Campus was fabricated for Alliance Glazing Technologies, Inc. using the Efco 403T glazing system. Finished frames were delivered to the job site. Skyridge Medical Office Building 3 is a 130,000 square foot expansion that is atttached to Skyridge Hospital in Lone Tree, Colorado. C.A.P. Inc fabricated this project for Alliance Glazing Technologies, Inc. using Tubelite 200 curtain wall and 14650 series storefront. Custom shear blocks were designed and manufactured by C.A.P. to accomodate the sliding entrance doors. Custom use of framing members was also designed by C.A.P. to "bump out" the system over the entrance area. Corner sections were loaded with steel to allow for high windload requirements. Fabricated frames were delivered to the job site for installation by Alliance Galzing Technologies, Inc.. 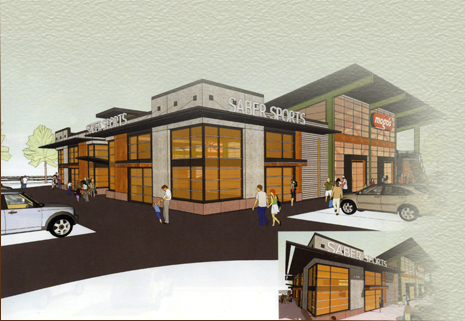 This 75 acre mall redevelopment project is located in Fort Collins, Colorado. C.A.P. Inc fabricated a Kawneer 451T storefront system for installation by Alliance Glazing Technologies, Inc. Finished frames delivered to job site. 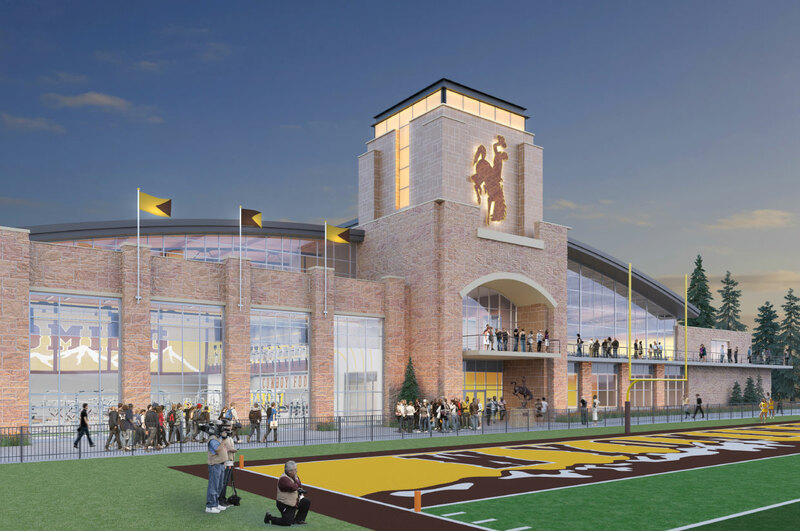 The Denver Broncos indoor pratice facility is a 90,000 square foot state of the art football pratice center. C.A.P. Inc fabricated Efco series 402, 403 storefront and 5900 curtain wall for Skyline Glass to install. Finished frames were delivered to the job site. Galvanize 2.0 is a 60,000 square foot office building located in Denver, Colorado. C.A.P. Inc fabricated this project using Kawneer 451T storefront and Kawneer 1600 curtain wall for Horizon Glass. Finished and KD frames were delivered to the job site. Glazing Contractor: Alliance Glazing Technoligies, Inc. 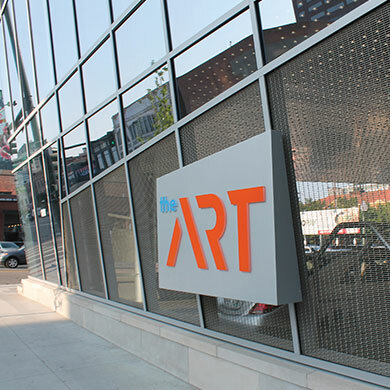 The Art Hotel is a nine story boutique hotel with 50,000 square feet of office space. C.A.P. Inc fabricated Kawneer 451VG storefront and 1600UT curtain wall for Alliance Glazing Technologies, Inc. to install. Because of the unique contour of this building, extensive compound miters and custom vertical notching were required for the mullions. Finished frames were delivered to the job site in downtown Denver, Colorado. 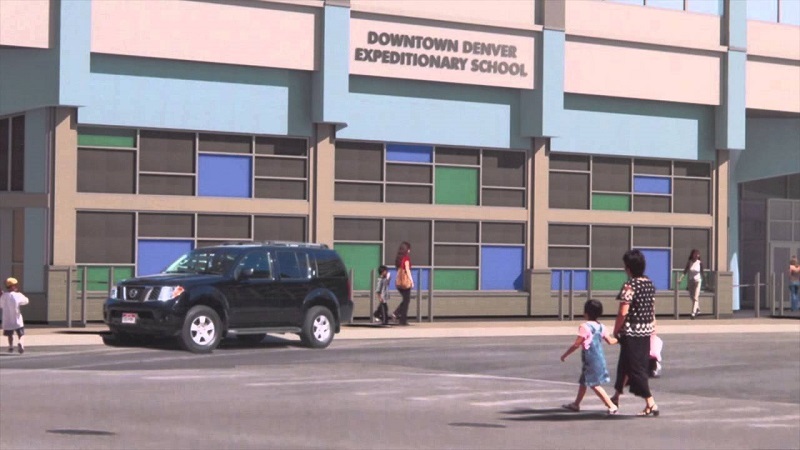 Denver Public Schools new downtown campus is a 13 story multi-use building. C.A.P. Inc fabricated a Kawneer 451T system for the exterior and a 450 system for the interior. Finished frames were delivered to the job site for Alliance Glazing Technologies, Inc. to install. 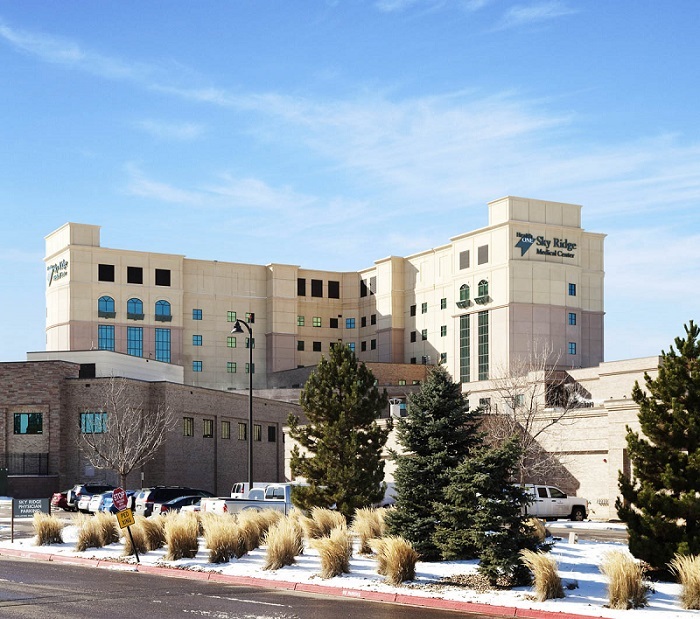 Sky Ridge Medical Center is a general medical and surgical hospital in Lone Tree, Colorado. C.A.P. Inc fabricated and pre-glazed a Kawneer 451T storefront system and a Kawneer 1600 curtain wall system for this building. This project required over 300 custom designed steel plates to fasten the fabricated frames to the structure. Finished frames were delivered to the job site for installation by Alliance Glazing Technologies, Inc. The National Institute of Standards and Technology (NIST) in Boulder, Colorado is a 284,000 square foot three level facility. C.A.P. 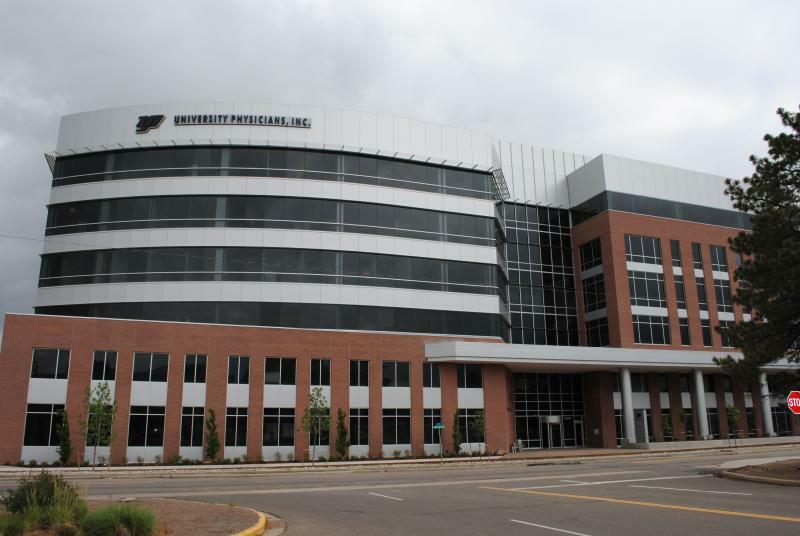 Inc fabricated a Kawneer 1600 UT curtain wall system in three different sizes for this project. Finished frames were delivered to the job site for installation by A-1 Glass Company. Castle Rock Adventist Hospital is a 212,000 square foot facility built to serve people south of the Denver Metro area along the I-25 corridor. C.A.P Inc fabricated this project for A-1 Glass using Kawneer 1600 curtain wall with custom deep covers and pressure plate extensions. Finished frames were delivered to the job site and stood up into place. North Metro Fire Headquarters is a segmented radius building in Broomfield, CO. C.A.P. Inc fabricated this project using thermal storefront and curtain wall for Harmon Glass. Green Valley Ranch E12 Campus was designed to be a modern eco-friendly shared campus school. Included is a world class hi-performance learning center. C.A.P. Inc fabricaded a Tubelite P4553 storefront system as well as installing custom hardware on the entrance doors for Metropolitan Glass. Finished frames were delivered to the job site. 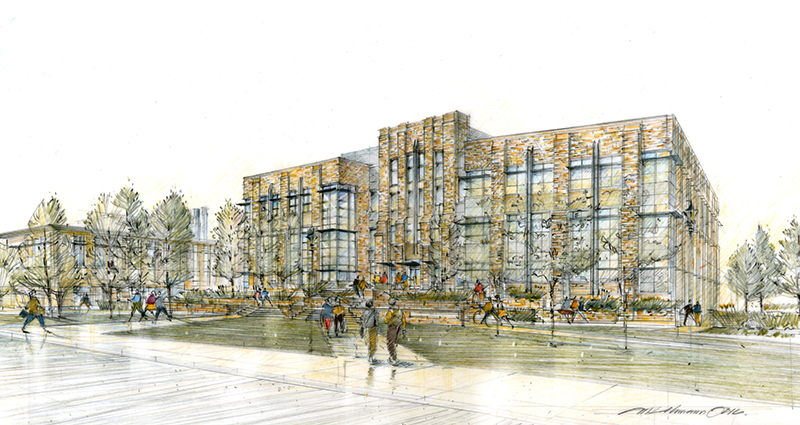 Window replacement for the lobby, clerestory, cafeteria, and student lounge at the DU Centennial Campus. C.A.P. Inc fabricated a Tubelite T-14000 storefront system a loaded steel in the vertical mullions for Harmon Glass to install. Finished frames were delivered to the job site. Denver Hospice is a senior care facility in Denver, Colorado. C.A.P. Inc fabricated the curtain wall and storefront for Harmon Glass, as well as integrating over 200 custom .040 brake metal corners and flashings to enhance the glazing system. 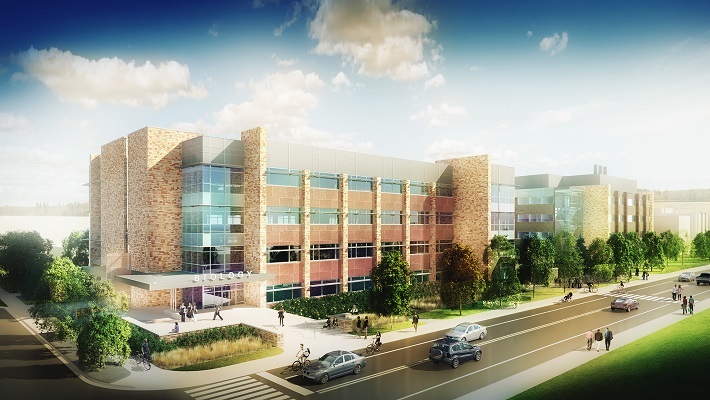 University Physicians Inc. is a 4 story 200,000 square foot office building located in Aurora, CO. C.A.P. Inc fabricated a Kawneer 1600 SS curtain wall system for Trainor Glass to install. Finished frames were delivered to the job site. 1800 Larimer is a 22 story office building in the Denver central business district. C.A.P. fabricated custom Encapsulated interior stool trim. Over 1100 of the brake metal stool pieces had custom cut-outs and notches. Finished pieces were bundled and delivered to the job site for installation by Harmon Glass.